We are to understand that in the quest to making a liberal India, we are sacrificing our age-old traditions and this can lead to a state where we will be empty and lost. Sabrimala verdict fails India. 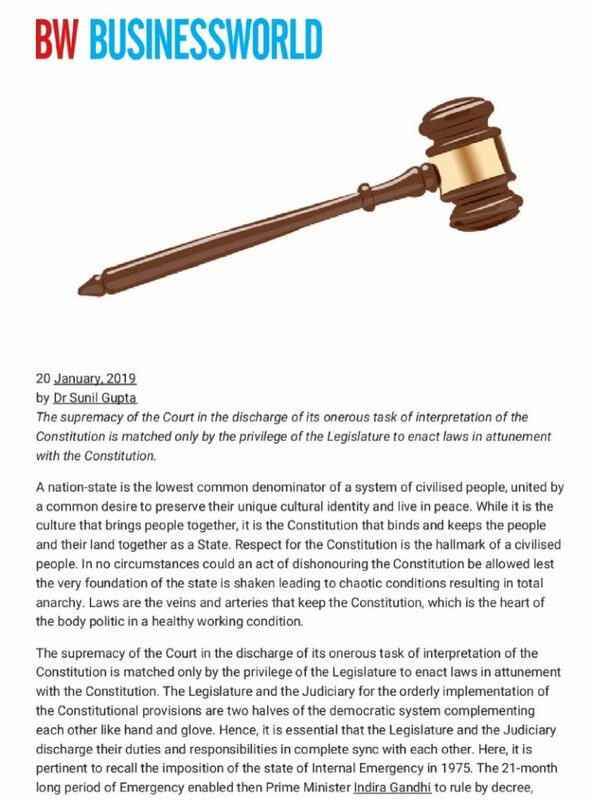 When we have freedom of expression as a basic right under the Indian Constitution then why violate this right by having a contempt of courts act? 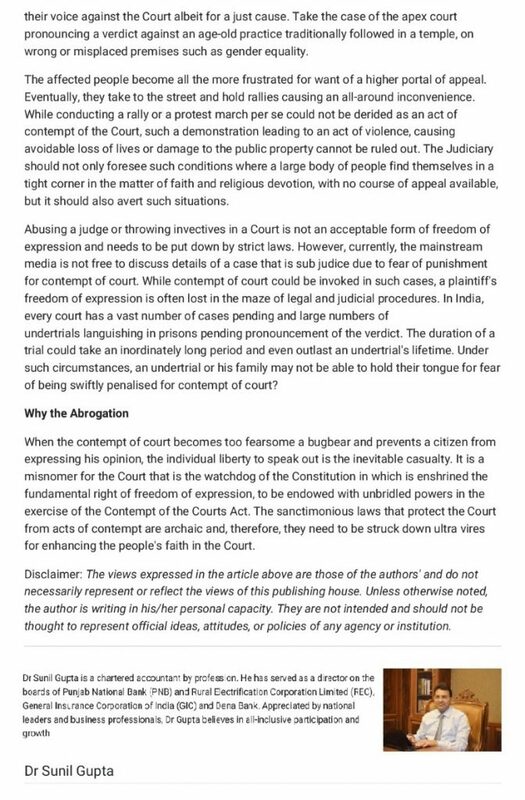 Any just criticism of court judgment cannot be held punishable. There are limits to everything. Yes, when you interfere with execution of court order, it is contempt. But by debating the accuracy of any judgment, one doesn’t commit contempt. The problem is we are looking at every happening today with a political underpinning. What is wrong if court has declared the temple ban as unconstitutional? Why bring religion and customs in this? BJP promised to repudiate obsolete laws when they came to power. They even did so for many legislations. But Contempt of Court is still pending and it rightly deserves attention of law ministry. No other institution in India enjoys such unrestricted powers as the Indian judicial system. That is good but by asking people not to even criticise wrong verdicts is like subverting our fundamental rights. Can we reintroduce the jury system in cases that are of extreme importance to faith and culture. At least the informed people can assist the courts in reaching a fair decision in such cases. There is no such need to totally repeal the Act but yes some provisions can be reconsidered. It is the Supreme Court of India that must rework this Act and introduce long-pending reforms. Even in cases of contempt we see people with power escape any punishment and the burden falls only on the vulnerable. Even judges fear high-profile advocates and their clients. 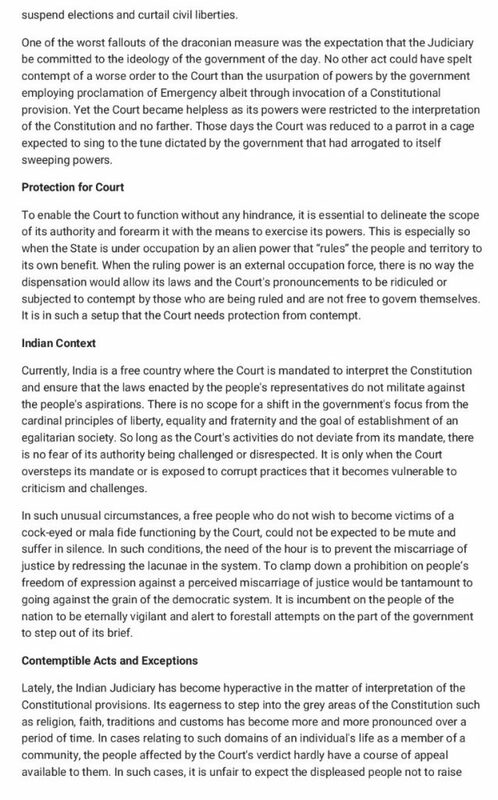 India has representative democracy but not representative judicial system. So who gives two or three judges the right to decide over matters related with faith of millions of people? This is unfair, unjust. I really wanted to post a quick note to be able to say thanks to you for all the nice ways you are writing at this site. My time consuming internet search has now been rewarded with extremely good insight to share with my best friends. I would say that we website visitors actually are very much fortunate to live in a remarkable website with very many special professionals with valuable tricks. I feel very much lucky to have come across your entire webpages and look forward to tons of more amazing moments reading here. Thanks once more for all the details.